Finding the right swim cap is pertinent to swimmers of all skill levels, whether it’s your very first time in the pool, or you have been swimming your entire life! A good cap really makes a difference in your training in the pool. There are so many different options that it can be a bit overwhelming, especially when it comes to the material that the cap is made from. Here are a few different options to help your search become a little less stressful! Silicone caps are the most commonly used swim caps. One of the reasons is that silicone caps are extremely durable and will last you for years if you take good care of them. Silicone caps tend to be a favorite of competitive and professional swimmers, due to the material. Not only is it long-lasting, but it also lends itself well to slipping on and off without pulling hair (a plus for both men and women!). This type of swimming cap is ideal if you swim in cold pools, lakes, rivers, or the ocean. It’s made out of the same material as wetsuits, which makes it ideal for cooler climates. Neoprene swim caps are more suited for open-water swimmers and triathletes than for competition swimmers racing in heated pools. 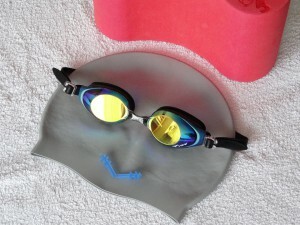 Another great benefit of the neoprene caps is that, like silicone caps, they do not pull your hair, which can be a problem faced by many swimmers using swim caps of other materials. Lycra caps are similar to neoprene swim caps, in the sense that they are made from the same material and fabric as many bathing suits. Many swimmers prefer Lycra caps because they have a looser, more comfortable fit than latex caps; due to the looseness, a Lycra cap is a good choice when maximizing your speed is not a concern. Lycra swim caps cost double what latex caps do, but usually have a longer lifespan because the stretchable material is designed to handle wear and tear. Hopefully these swim caps have gave you a few more options to consider when in the market to buy a new swim cap. There are many others you can purchase, but silicone, neoprene and lycra are 3 of the best caps you can find! What is your favorite type of swim cap? What do you like about it specifically? Let us know in the comment section below!